Solace PubSub+ for Pivotal Cloud Foundry (PCF) enables you to take advantage of the leading multi-cloud, multi-protocol messaging solution which makes app interconnectivity easy and makes production apps scalable, robust, high-performant, and easy to manage. Solace PubSub+ was designed to be deployed across all your IT environments including your non-cloud datacenter, all leading public clouds (AWS, Azure, and Google Cloud Platform) and the popular Platform as a Service, PCF, in order to provide a uniform messaging fabric for all your apps and connect them no matter where they are deployed. Solace PubSub+ supports all kinds of messaging APIs, QoS, and data streaming as part of one platform across all clouds in a high-performance, WAN-optimized, easy-to-manage solution. It is easily deployed in your public and private cloud environments and forms the perfect backbone for single or multi-cloud messaging support of your cloud-native microservices, IoT, big data capture, and next-generation digital apps. Solace PubSub+ for PCF provides plans for both shared message broker instances for cost-effective development as well as a variety of plans for dedicated message brokers of varying performance, scale, and high-availability. Together, they meet the requirements for a range of robust test and production deployments. One of the key strengths of Solace PubSub+ is its support for many different open transports and protocols, making Solace PubSub+ message brokers ideal data distribution platforms to connect to any app. In addition to the documentation here, there is also a wealth of information on the Solace Developer Portal. For cloud operators, the following section shows how to install and configure Solace PubSub+ for PCF in your environments. Solace offers two PubSub+ for PCF tiles: the Enterprise Evaluation tile and the Enterprise tile. The Enterprise Evaluation tile is comprised of two message brokers: Solace PubSub+ Standard, and Solace PubSub+ Enterprise Evaluation Edition. PubSub+ Standard is a forever free enterprise-grade message broker that supports publish/subscribe, queueing, request/reply, and streaming, along with integrated high availability (HA) and disaster recovery (DR). The PubSub+ Enterprise Evaluation Edition is a free 90-day evaluation version of the PubSub+ Enterprise edition, which supports all the features of PubSub+ Standard, but with increased performance and scaling. You can download an Enterprise Evaluation tile here. Also, if you are interested in a support plan for Solace PubSub+ for PCF, contact Solace Support or your local Solace sales representative. The Enterprise tile is also comprised of two message brokers: Solace PubSub+ Standard, and Solace PubSub+ Enterprise. Contact Solace Support for information on how to obtain this tile and associated support plans. Solace PubSub+ for PCF offers operator configurable service plans. As of release 2.2.0 the Preconfigured Service Plans are now editable by the operator. There are also additional Unconfigured Service Plans that can also be customized by the operator. Standard Medium A single message VPN on a dedicated Solace PubSub+ Standard message broker with associated properties set to moderate values. Standard Medium-HA A single message VPN spanning 3 Solace PubSub+ Standard message brokers in a high availability (HA) configuration with associated properties set to moderate values. Standard Plan 3 A unconfigured service plan for the operator to customize. This plan can deploy a Solace PubSub+ Standard message broker. Standard Plan 4 A unconfigured service plan for the operator to customize. This plan can deploy a Solace PubSub+ Standard message broker. Enterprise Shared A single message VPN in a shared Solace PubSub+ Enterprise or Enterprise Evaluation Edition message broker. Useful for light traffic and development. Enterprise Large A single message VPN on a dedicated Solace PubSub+ Enterprise or Enterprise Evaluation Edition message broker with associated properties set to high values. Enterprise Medium-HA A single message VPN spanning 3 Solace PubSub+ Enterprise or Enterprise Evaluation Edition message brokers in a high availability (HA) configuration with associated properties set to moderate values. Enterprise Large-HA A single message VPN spanning 3 Solace PubSub+ Enterprise or Enterprise Evaluation Edition message brokers in a high availability (HA) configuration with associated properties set to high values. Enterprise Plan 5 A unconfigured service plan for the operator to customize. This plan can deploy a Solace PubSub+ Enterprise or Enterprise Evaluation Edition message broker. Enterprise Plan 6 A unconfigured service plan for the operator to customize. This plan can deploy a Solace PubSub+ Enterprise or Enterprise Evaluation Edition message broker. A Solace PubSub+ deployment under PCF can be configured to support integration with existing cloud services and hybrid cloud deployments. TCP routes allow access to Solace messaging services hosted inside your PCF domain from external networks. By default, a PCF-hosted service is not accessible to external networks. Hybrid cloud: Other Solace PubSub+ message brokers deployed outside PCF can establish Bridge connections to Solace PubSub+ services inside your PCF cloud. External client app: Apps deployed outside PCF can communicate via messaging with apps deployed inside PCF by connecting to a Solace PubSub+ service deployed in PCF. IoT: Devices using MQTT or REST can connect to Solace PubSub+ services from outside PCF to communicate with your apps deployed inside PCF, look for the TCP Routes for IoT—MQTT Java Application Tutorial Getting Started Samples with full source code available in GitHub. Mobile apps: Mobile and web apps can use web messaging to connect to Solace PubSub+ services from outside PCF to communicate with your apps deployed inside PCF. To use TCP routes, you must enable and configure TCP Routes at installation time with a selection of default settings for each messaging protocol you wish to use. Once enabled, TCP routes can be fine-tuned per service at service creation time. System logging allows you to redirect the logs from the Solace PubSub+ PCF components to an external syslog service. To use system logging, you must enable and configure system logging at installation time. You can enable the use of an LDAP server for the Solace PubSub+ message broker’s authentication and authorization needs. This configuration allows you to grant an LDAP server control over Management access and Application access. To use LDAP, you must enable and configure LDAP at installation time and make a choice about Management Access and Application Access. Easy integration with third-party products such as big data, ESBs, JEE, DataPower, and more. Comprehensive authentication, authorization, and encryption features to ensure that your infrastructure and information are protected at all times. The most robust data movement infrastructure available today, offering fault tolerance and disaster recovery. Integrated federation and distribution for connectivity between Solace message brokers. High-performance messaging middleware which can cost-effectively meet the needs of any app. Simplified operations with multiple management administration interfaces. Virtualize application groups on a single Solace message broker with complete message isolation through Solace Message VPNs. Solace PubSub+ is a managed service. The tile deploys the PubSub+ message brokers onto PCF’s IaaS. The Solace PubSub+ tile registers a service broker with PCF and exposes its service plans in the PCF Marketplace. 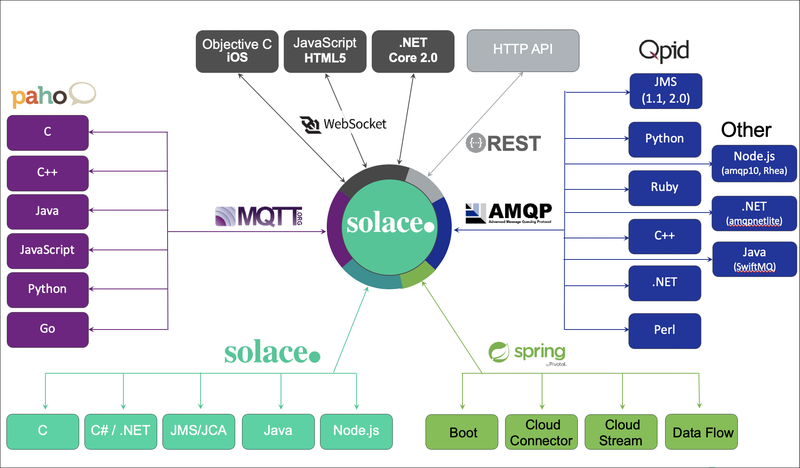 The diagram below provides an overview of the product architecture of Solace PubSub+ for PCF. Note: As a major and renamed release, upgrades from the older named product solace-messaging (v1.4.0 and below) to solace-pubsub are not possible. However, it will be possible going forward to upgrade from Solace PubSub+ for PCF v2.0 to subsequent releases. The following table provides version and version-support information about Solace PubSub+ for PCF. WARNING: Solace PubSub+ for PCF v2.1.1 and earlier require a Ubuntu Trusty stemcell. The end-of-life date for Ubuntu Trusty is April 2019. If a security vulnerability is found on this stemcell after April, it will not be fixed. No support for RADIUS-based authentication. Dynamic Message Routing mode on service instances upgraded from 8.12.x must be enabled by the operator. Multi-Node Routing is not supported. Provide any bugs, feature requests, or questions to Solace Support.